Atlas Copco surprised the market with a new, very compact oil-injected rotary screw compressor from 7 to 37 kW: the 7-37 GA VSD+. Besides a small footprint, it offers a leap forward in Free Air Delivery (improvements of up to 12%), and a breakthrough energy-efficiency: it requires on average 50% less energy than a comparable idling compressor. This new type of compressor offering a variable speed (frequency-controlled), will be suitable for most industries and aims to contribute significantly to the green economy needs. Atlas Copco translated the most requested needs of its customers in this new type of compressor: better performances, with less energy consumed, low noise levels and a compact footprint. With the GA VSD+, a variable speed drive compressor achieves better performances even at full load than a comparable idling compressor. This innovation will enable all compressor users to switch over to variable speed drive compressors, an important step towards a more sustainable industry. Atlas Copco evaluated every part in this compressor: a more efficient fan, robust air intake system, eliminating all blow-off losses, and the best electronic components together with the new drive train add up to energy savings of 50% on average compared to a traditional idling compressor of the same type. 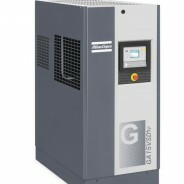 The new GA VSD+ is another 15% more efficient than Atlas Copco’s current Variable Speed Drive compressor (the GA 7-37 VSD). A full feature version with an integrated dryer is available as option. Several key components like the drive train as well as for the general design of the GA VSD+, are protected by Atlas Copco, with many patents on their way.